Listen up, ladies! Who wants to learn how to snowboard? You do? Well, you have great timing because this weekend is the SheRide Snowboarding Camp at Durango Mountain Resort, aka Purgatory. The all-women’s snowboard clinic is perfect for all levels, and instructors coach students on the first day of the workshop, which starts Friday, Jan. 24, and runs through Sunday, Jan. 26. Participants can sign up for one, two, or all three days. On the last day of camp, SheRiders will join in a group victory ride. Beginners will get all the coaching and encouragement they need from instructors, while advanced boarders will benefit from more in-depth instruction and tips on their riding stance and skills using video movement analysis. SheRide helps women work on carving, bumps, jumps, park, switch, and speed. SheRide’s coaches share “two common characteristics: the love of riding and a passionate dedication to helping other women achieve their riding goals while having a great time,” according to the SheRide website. SheRide instructors don’t limit themselves to snowboarding. The organization is dedicated to offering all-women’s clinics to teach women all sorts of sports, including mountain biking, horse riding, kayaking and even standup paddleboarding. To sign up for the Durango camp, register online. 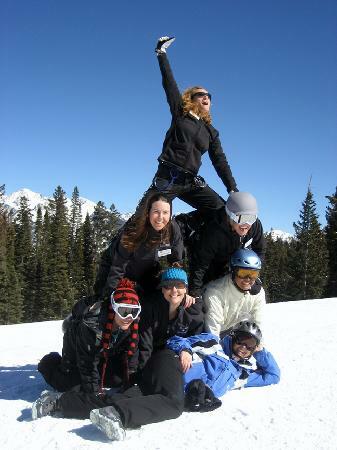 SheRide will also offer a snowboarding clinic Feb. 21-23 at Snowboard Ski Resort in Utah. While you’re in town to learn how to snowboard, stay with us at the Durango Quality Inn. Our hotel is a short, straight shot south of Durango Mountain Resort, so be sure to book your room with us today!